Few people have a career record as impressive as Leroy Chiao: He’s an astronaut who flew three Space Shuttle missions, was the commander of ISS’ Expedition 10, and conducted countless research projects in space as well as down on Earth. After working for NASA, he became an entrepreneur, motivational speaker and consultant, for which his astronaut’s practical experience and chemical engineering background present a unique combination of insights. 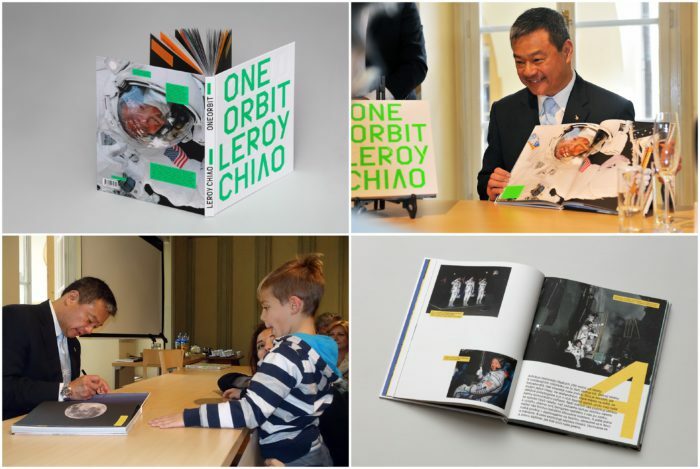 Last autumn, he has visited the Czech Republic to launch his book “OneOrbit/Život jako výzva” (“Make The Most of Your OneOrbit”), which was published by the Zdeněk Sklenář Gallery and first introduced at the International Book Festival in Beijing. English and Chinese editions of the book were published shortly after. We’ve talked with Leroy Chiao about returning to the Moon, facing the health challenges of a flight to Mars, working in space internationally and more. Leroy Chiao at his book launch in Prague. I’d like to start with your book “Make The Most of Your OneOrbit”. The photography in there is amazing. What do you consider the strongest moment or experience connected to the pictures in your book? Each one is so different, it’s hard to pick a favorite! One of my favorites, though, are the pictures of the Moon, because the Moon is what inspired me so many years ago to become an astronaut. We recently had the “Supermoon”, we got to see the Moon a bit brighter and clearer, and I showed my kids. They were very excited. So that was probably one of my special ones, because it started my dream, and that picture means dreams to me. In many of your articles, you emphasized that the Moon is a stepping stone of our journey to Mars and that we should go back there. Do you think the political landscape of going to the Moon is going to change soon? I think it will, because of the presidential election we’ve just had. We had worked on our way of going back to the Moon back in 2005 and 2006. In 2009, the White House appointed a committee which I was a member of, and we were told by President Obama’s chief of staff that they would not be going back to the Moon, because that was George Bush’s program. We were cast to find ways to explore without going back to the Moon. Now we may see an effort to go back to the Moon, especially because many members of the space community around the world want to do it. The Russians and the Europeans had been in meetings and discussions for a few years. The Europeans have openly proposed going to the Moon, they’re talking about joint missions to the Moon. China recently announced a plan to send their astronauts to the Moon. To me, it makes a lot of sense also for reasons beyond space exploration – even for world politics. I think it would serve not only exploration goals, but also political goals of improving relationships between all of our countries. The International Space Station is a prime example of that: WWII and Cold War enemies coming together to build this very visible civil project. I think it’s bettering relationships between all of the partners. Going to the Moon for technical reasons as a step towards Mars also makes perfect sense, because we want somewhere we can test everything, a place where we can train astronauts for Mars. It’s a good place to go because it’s so close, only three days away, whereas Mars is typically around six months’ travel time away. What do you think about ESA’s director Jan Wörner’s concept of the Moon Village? I really like it. I met Jan Wörner and I’ve seen his presentation of the Moon Village. I think it very well fits for the US to come into that program, and to make this international coalition just like we did with the Space Station. I’m encouraged by the Europeans’ desire to go to the Moon. Aside from your astronaut career, you also became a motivational speaker and consultant for many space technology companies. What are the main insights from your astronaut’s career that you could use in the private industry? With my experience as an astronaut, I can help advise aerospace companies on details about spacecraft – such as how to make it more friendly for astronauts to operate. I can talk about my own experiences so that they can get an idea what it’s like, when they’re designing things. Outside of the aerospace industry, with the general public, I can use the excitement of space exploration as a backdrop to talk about other things. For example corporations are always interested in leadership and teambuilding, and technology innovation. I can talk about those subjects, how they can benefit and improve their business. I also talk to school kids about the importance of having a dream, working hard and having the courage to follow their dream. Sometimes it’s easy for young people to become discouraged, or they’re teased about something, and they give up, so preventing that is among my messages. You have lots of experience about how the human body works in space and the medical issues all astronauts encounter, and you’re currently the chairman of one of the panels of Space Biomedical Research Institute. What are the main challenges the Institute works on now, especially with relevance for future missions to Moon or Mars? The Institute was created to help solve medical problems we have in space. Unfortunately, it will come to an end this year; it was created by NASA with a 20-year life, and it’s ending in late 2017, but we have committed to redo research that helps us solve these problems. Some of them include for example that 70% of our astronauts who fly approximately 6-months missions have come back with some vision changes. That was something we didn’t expect and didn’t see when we were flying short missions on the Space Shuttle. This is an example of a new problem that we have to solve before we can send someone to Mars, because we don’t know why some people experience it and some people don’t, and we don’t understand if it will continue to get worse. If we send someone out there for longer than 6 months, will their vision continue to decline, or will it level off? Once we determine exactly what the cause is – we have some ideas – we will try to find a way to counteract that, find out how to treat people with the condition. Considering the journey to Mars, activities on the Moon seem like a good way to start with long-term human exploration beyond LEO, because in LEO, we have microgravity, the resulting muscle atrophy, ocular and other changes, but the astronauts are still protected from most of radiation as they’re inside Earth’s magnetic field. What do you think about the recent claims of Elon Musk that SpaceX would send people to Mars in 2020s, while we still don’t know much about the health challenges? Elon Musk is a very driven person. I’ve met him a few times and I do some consulting work for SpaceX, and what I’ve observed about Elon Musk is that he sets very aggressive targets for his teams. I think he does that intentionally to drive them and motivate them to work as hard as they can. He might sometimes be a little late, but he gets where he wants to go. The first launch of the Falcon 9 was several years later than he predicted, but he did it. The same for the Dragon spacecraft: it took a little longer to develop, but he did it. I think that in his Mars program, he’s shooting for the 2020s hoping that his team will get him perhaps close. He’s also planning to send the Red Dragon to Mars in 2018. Maybe it will be 2019 or 2020, but I think he will do it. He’s proposing to build spacecraft that can take 100 to 200 people at a time. That has never been even remotely contemplated before, so that might take a little longer, and he might find that it’s maybe not the most practical way to do it, but what I’ve learned about Elon Musk is never say that he’s not going to do it. Even with Tesla, there were plenty of times when the company almost failed, but then it came back. As for SpaceX, a lot of people thought it was impossible to build it, and it’s very successful today. I’m excited that he wants to go to Mars. He has said many times that he created SpaceX specifically because of that. So it may take a little longer than he said or hopes, but I think he will at least land a spacecraft on Mars in the next several years and then go on to actually land some humans on Mars, perhaps in collaboration with NASA. This is a great possibility of a government and commercial partnership to explore places like Mars. I’m interested to see what the next several years bring. Certainly, and cooperation with NASA might make the challenges of human health during the journey better to take into the question, because NASA has lots of experience with it, unlike SpaceX. Although the medical issues are very real, it doesn’t keep us from going. We just have to accept more risk. I’m sure that at some point in the future, we will determine the genetic traits that can help people better withstand radiation or resist the ocular changes, and we’ll be able to select people able to go to Mars and tolerate it better than others. It’s way too early for that, but looking into the future, it’s one way to counteract these negative aspects. People evolved here on the Earth and are adapted to it, and going into space, especially somewhere as far away as Mars, is going to be a big challenge in keeping people healthy. The possibility of a private company’s journey to Mars raises more questions, for example planetary protection. NASA is very keen on it and its Planetary Protection Office holds a lot of influence over missions to Mars, but it has no power over private entities. What is your opinion? Planetary protection is something we have to figure out, because even for the spacecraft we had sent, we can’t say with certainty that they were 100% sterile. Undoubtedly we have already sent something to Mars, but I also don’t think it should prevent us from exploring. That’s a part of exploration. We’re going somewhere nobody has ever been, and it’s impossible, especially if we send people, animals or any living things, of course we’re going to contaminate the environment. Planetary protection is something we have to pay attention to and consider it, but it should not prevent us from exploration. What do you personally think is the biggest technological or societal challenge we have to face in space exploration in the coming years? What would you like to see happening in the field in the first half of the century? I would like to see the international coalition to the Moon, and I would include countries like China. I think there’s a lot of reasons why we should work with China in space. Space is a good place for countries to work together, to have a visible and positive project or program where we have something in common. I hope to see us go to the Moon in some version of Jan Wörner’s vision of his lunar village, and then start planning our course to Mars to also go internationally there. I’m hopeful that all this will happen in my lifetime. Of course the big barrier is the cost of such a program, but an international coalition with partners like China who are aggressively funding their space program, and US, where we still spend most of all countries on space, and of course our European partners and the Russians with their abilities over all these years to conduct all of their operations in spaceflight, would be an ideal partnership to go to the Moon and then to Mars. Is there anything you’d like to say to the readers in the Czech Republic? As I said during my visit to the Czech Republic, I have really enjoyed coming there. I fell in love with Prague, I met many very friendly and nice people there, and I just can’t say enough about how much I enjoyed visiting and how much warmth I feel there. With Zdeněk Sklenář and Helena Sklenářová, we created the book “OneOrbit/Život jako výzva” and we’ve been friends for many years, in fact from 2008! I look forward to visiting again and I wish all the people in the Czech Republic well. The interview was conducted in November 2016, a few weeks after the book launch of “OneOrbit/Život jako výzva”. Its Czech translation will be published by Přírodovědci.cz. If you’re interested in space exploration in general and Moon exploration specifically, make sure you haven’t missed this interview with ESA’s Director General Jan Wörner. As to the Moon Village and other programs – we’ll see what the following years bring. I hope this is by far not the last time I’m writing about it.